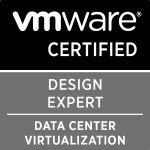 Just a very quick posting as so many of the top bloggers out there have covered it so well that VMware have released their new Exam set the VMware Certified Advanced Professional – VCAP. Duncan Epping has posted all about the VCDX 4 (VCDX4-DCD) side of things here and details the steps now to become a VCDX4-DCD. Quite disappointed they had to add the DCD part personally as all it’s doing is adding to the long winded acronyms some of us carry at the end of our mail signatures/business cards. Categories: Certifications, Virtualisation | Tags: VCAP, VCAP-DCA, VCAP-DCD, VCDX, VCDX-DCD, VCDX4, VCP, VCP4, VCP4 upgrade., VMware | Permalink.